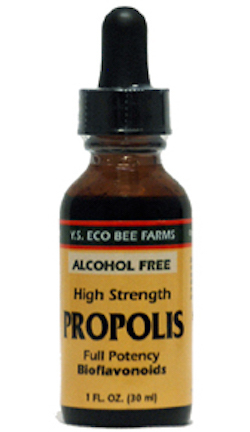 Propolis is a resinous substance gathered by the bees from certain select trees and is used to line the hive to keep it sterile and the bee colony thriving. Bee propolis is one of nature's richest sources of bioflavanoids. Our propolis is specially harvested and extracted to capture the full spectrum of essential tree resins (all the possible varieties, different locations and seasons). Propolis is a major source of bioflavanoids, antioxidants and deep immune defense works. Other ingredients: vegetable propylene glycol (80%). Contains no yeast, salt, sugar, starch, milk, preservatives or colors. Suggested Use: As a dietary supplement, mix 10-15 drops in a little warm water, tea or directly on the tongue. Or mix with little honey (1/4 tsp.) Take 2 times daily.